St. Elias Centre is a modern, multi-purpose event centre in Ottawa offering all of the services you need to host an incredible banquet event. Our venue spans over 11,000 square feet and can accommodate parties of 50 to as many as 1000. After undergoing recent upgrades to our facilities, we offer one of the most elegant banquet halls in the city, featuring a spacious lobby, full-size theatre stage, soaring high ceilings, and contemporary décor throughout. 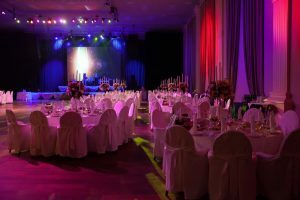 Simply put – our event centre will make a glowing first impression with your guests. Anyone who has organized or attended an event knows just how integral the food is for the success of a hosted occasion. And rather than spending time searching and sourcing different caterers to find one that can suit your needs, St. Elias Centre can take care of this all for you. We provide in-house, premium catering services with delectable culinary creations offered by our Executive Chef and award-winning culinary team. Our team will plan the ultimate dining experience for you and your guests using the freshest ingredients with a selection of mouth-watering menus to choose from. This includes our popular Canadian and Lebanese specialty menus. Whether it’s breakfast, lunch, dinner, buffet-style or grab-and-go items – we have you covered! If you need assistance with the planning process, our on-site professional client and guest staff are here to be of service. They can help you determine the best package that will suit your budget and catering needs. They can coordinate external services, in case you need any special equipment or entertainment for your special occasion. And, when you need an appointed person to handle guest inquiries and related tasks, we’re can handle that too. At St. Elias Centre, we always have convenience in mind when it comes to our clients and guests. That’s why we’re centrally located across from Mooney’s Bay just off of Riverside Drive. So accessing our venue by transit or vehicle is easy and straightforward. You’ll also find over 400 on-site parking spots available to accommodate your guests so they won’t have to search around for a spot. If premium quality service is what you have in mind when planning a banquet in Ottawa, St. Elias Centre is the ideal venue for you. Come see for yourself why we’re one of the most reputable banquet halls in the city. Whether it’s a wedding, anniversary, corporate event, or if you’re hosting foreign dignitaries for a special evening – you can depend on our expert team to plan and execute your event seamlessly for a memorable evening.